The crime appears open-and-shut: Pushed to the brink by an abusive husband, state police trooper Tessa Leoni finally snapped and shot him in self-defense. But Tessa isn’t talking – not about her dead husband, her battered face, or her missing six-year old daughter. Now, Detective D.D. Warren will have to race against the clock to unearth family secrets, solve a murder and save a child. "Gardner’s characters are fully drawn. . .and her taut storytelling and dizzying plot will appeal to fans of Harlan Coben." "Having already produced a dozen successful thrillers, Gardner proves herself not only a very clever storyteller here, capable of pulling together a complicated series of events, but also a writer able to invest her characters (particularly her female ones) with emotional substance. Compelling and unexpected, this tale of mystery and maternal devotion shows Gardner at her very best." "Gardner sprinkles plenty of clues and inventive twists to keep readers off-kilter as the suspense builds to a realistic, jaw-dropping finale." 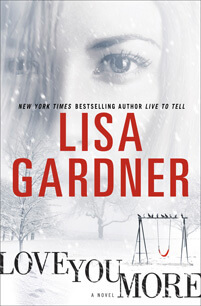 "Gardner hits an impressive new high with her latest taut thriller, a three-way chess game — with the life of a 6-year-old girl at stake. Unbelievably gripping and clever, you won’t want to put it down until the final page!" "In her fifth case (Live To Tell, 2010, etc. ), Sergeant Detective D.D. Warren takes on one tough mother. Tessa Leoni is smart, brave, resourceful and quirky, among other character traits that bring to mind, yes, D.D. Warren, who might well be her mirror image. . . You won’t often find two such sympathetic protagonists paired, refreshingly, as antagonists."